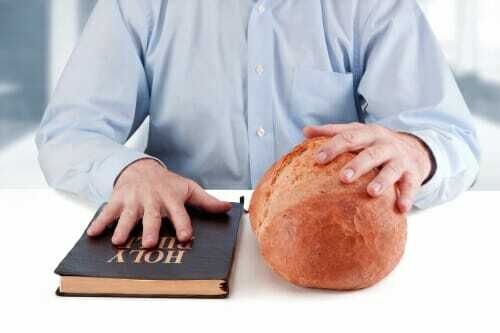 Have you ever considered the relationship between Jesus and food? Yes, food tempted Him too! Even though the particular food that tempted Him may have been different from ours, the struggle was real nonetheless. So Jesus understands what we are going through! How Jesus responded to a food temptation gives us a great example of how we too can overcome. Now Luke 4:1-13 tells of a story of Jesus and food. In the wilderness, Jesus endured the devil’s temptation. He was fasting for 40 days and of course was hungry. Before we assess what Satan said, let’s look at the character of the one who said it. Who is Satan again? In John 8:44, Jesus called him the father of lies! Here’s a good principle to follow: Before you receive any message, consider the character of the Messenger. In John 10:10, Jesus says that Satan comes only to steal, kill, and destroy. Jesus did not follow Satan’s voice. Instead He was filled with the Holy Spirit. As Believers in Christ, so are we! Jesus did not make a move unless the Holy Spirit directed Him. As God’s children, we should pause when we are tempted to ensure the Holy Spirit guides our actions. Know this: The enemy wants you to act fast in the face of temptations! When you act fast, you react to situations rather than respond to them. Think about this: Is it better to react to a medication or respond to it? A reaction is like having an allergic emergency, with negative consequences. Reactions typically mean that you are acting out what you’ve always done, whether it is good for you or not. But a response is thoughtful, considering not only what is good for you now, but what is good for you in the future. Will yielding to temptation either steal, kill, or destroy something you care about? If so, that is a temptation you don’t want any part of! Get the tempting item out of your sight and do not lead yourself into temptation. It is a losing game. The devil also began tempting Jesus with the phrase, “If You are the Son of God…” The devil always likes to attack our identity. He posed the question as if Jesus had something to prove. But Jesus was secure in His identity. He knew who He was and whose He was. God wants us to be that secure of our identity in Him. Whenever you meditate upon He who is within you, you gain strength to overcome whatever is outside of you. However when you give more attention to what is outside of you than the One who is within you, you feel under subjection to outside forces. So how did Jesus respond to Satan’s temptation? “But Jesus answered him, saying, “It is written, ‘Man shall not live by bread alone, but by every word of God (Luke 4:4).” Jesus quoted scripture to the enemy. That is how we should use scripture too. God’s word is our sword, our offensive weapon! This particular word affirms that Jesus knew something more important was at stake in the moment than gratifying His flesh. Eating is good and God created man to enjoy the food we eat. After all, why would He bother to give us taste buds? But there is a time and a place for everything. Jesus knew that it was not the time nor place to eat. Jesus’ escape was through the Word. So the guidelines are clear. It takes daily practice so that this response becomes second nature. But isn’t your future worth it to experience the liberty Jesus died to give you? I struggled with this issue on my own weight loss journey to losing 85 pounds. But I discovered that you can win the Spiritual and mental battle that can make you inconsistent and lose motivation on your weight loss journey. I developed the Take Back Your Temple program to show you how you can win the battle too. God has a way of delivering the right word at the right time. All praise to Him! Our God is good, Olga! It makes me feel better too, Elizabeth! Jesus had to deal with being in an Earthly body. He was tempted, got hungry, was tired as we are. Yet He still fulfilled the purpose God had for Him. When we learn from Him, we too can have confidence that we will finish well. A Word in due season! Our God is right on time, SKP! Kim, thank you for sharing what God has given you. I am so thankful for your ministry. I appreciate your comment, Irene – God bless you! This is about so much more than food. Thank you so much! This is right on time for me in many areas! Be blessed Kimberly in health and wholeness! So true, Kathy. God wants us to be healthy Spiritually, mentally, and physically! I am having trouble eating at night after supper!! Even when I keep the “bad” food out of the house, I find myself over-indulging on oatmeal, cheese, etc. Would appreciate prayers for wisdom ! Hi Debbie – you have my prayers! When you say “overindulge,” what is your standard for eating with self-control in this area? In other words, what do you think would be a reasonable amount to eat after supper that doesn’t stray into overindulging? Once you set that standard as to what eating normally looks like in this area, then you can start to work on strategies to keep that standard. Thank you Ms. Kimberly. All of the scripture references meditated to my spirit and immediately gave me an empowerment that Jesus lovingly entitled to us all. I look forward to reading more of your encouraging and informative articles. God bless. Thanks Karren – I am grateful to God for giving me a hunger to mine His word and live by its truths. He gave us His word to heal us and reveal to us the abundance of peace and truth. May you receive a continual blessing from it. Kimberly , thank you for your article on temptation and the way our Jesus dealt with them. May I ask if any of your members have a problem of beating oneself up with guilt and try to clean up a past guilt indulgence with excess exercise, fast or laxatives? God bless you and your ministry in Christ Jesus. That is an excellent question, MC! I have heard of Christians who suffer from bulimia, which is the condition you are describing. God has given a word to me for those who suffer from this issue. I am meditating on some scriptures for it and will have an article on this soon. I will email you the link to it also when I post it. God bless you! Update: Here is the link to the article. I will email it to you also. God bless you! Thank you for your post Kim. I am continually amazed at the word given in due season and how much God has blessed you with wisdom, insight, and understanding of His word to give to others. You are such a blessing to the body of Christ. Keep listening to Him as you do. That was powerful. To stop and think when faced with temptation that we need to consider if it will kill, steal and destroy. Thank you for your obedience in sharing this information. I just think you are amazing! You present everything so well.. I enjoy all of your emails. One day I hope to try your course (when I can afford it). I currently struggle with binge eating and at 150lb am bot massively overweight but am concerned about my health and long for mental peace. I love the ‘subject’ of food/eating and really hope to have a website of my own one day. Yours is a real inspiration. You have a gift and a very clear and christ centered ministry! May God bless you with super grace and provision! Thank you Ruth – may the Lord continue to bless you! Life changing lesson! Thank you for being obedient by sharing your testimony! This article has given me a different prospective on how to handle my own challenges. You are welcome, Kesha. It’s not always easy to face food temptations but we have the ability to overcome through Jesus’ example!